A Metrology company based in France had establish a strong and growing presence in their local area and spread successfully into a national company and into Germany. They retained the services of Ampa Consulting to investigate the UK market to establish size, price points and main competition and customers. 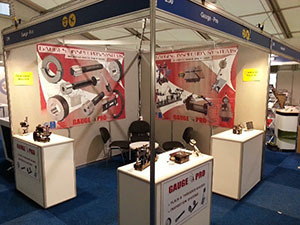 Following a successful review of the UK market, a marketing strategy was developed with Ampa Consulting and customers were approached, stands were booked at exhibitions and manned by client and Ampa representatives and a profitable business was started into the UK market. A UK presence was established to support customers and develop the business for the future. Jinan Worldwide Auto-Accessory Limited (JWAA) is one of largest valve and tappet manufacturers in China. Their production covers 75,000 square meters, with over 3000 employees.The annual capacity reaches 60 million valves, and 10 million tappets ranking JWAA as the first in the Chinese industry. JWAA’s class leading research and development capability ensures achievements in scientific research winning them National-level New Product Awards and Chinese Auto Industry Science and Technology Progress Awards. JWAA products cover all engines from large to mini size and from automotive engines to engineering machinery and generator sets, etc. Whilst JWAA are very strong in China and North America they wanted help to expand into Europe. The company appointed Ampa Consulting to support its existing business in Europe and to work to develop that business into more market share with more customers. JWAA has recently secured 3 new programs with 2 major OEM’s in Europe and Ampa Consulting is continuing to grow and service this business. Total customers now include Shanghai Volkswagen, Ford EU and NA, Jaguar Land Rover, Tian Jin TOYOTA, SAIC, DPCA, FAW, CNHTC, CHERY, DONGAN, DCEC, CCEC, WeiFang diesel works, Yulin diesel works, shanghai diesel works, Wuxi diesel works and Dalian diesel works, Korea Doosan etc. 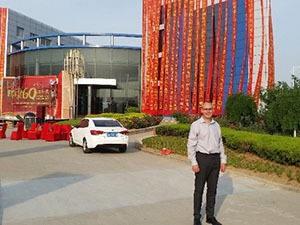 Ampa Consulting outside a decorated JWAA main reception to celebrate 60 years in business in Jinan, China. 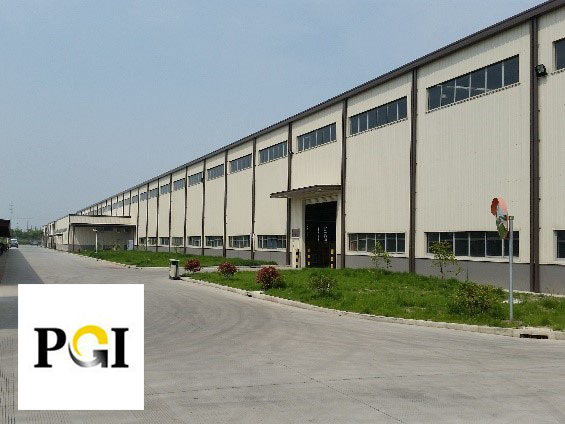 PGI's new facility to handle the growth in business. PGI Auto Components is a significant producer of aluminium High Pressure Die Castings to the global automotive industry. Based in China just North of Shanghai their production covers 40,000 square meters and they have over 540 employees. Started in 2004 by 2 American companies PGI has grown significantly to be a major player in the supply of small to medium castings from their range of 280 to 1650 tonne casting machines. Ampa Consulting has worked with PGI for many years, initially supporting but quickly growing their business in Europe. The wining of major contracts in both aluminium and niche cast iron products saw their turnover increase significantly. It was soon identified that warehousing arrangements were not up to the increased level of business and Ampa Consulting identified and helped transition over all the business to a new warehouse partner securing increased capacity, better performance and improved costs. With Ampa Consulting's help PGI has grown its market share within Europe and expanded its customer base, now including Ford, GM, Cooper Standard and Jaguar Land Rover amongst it’s active customers.